::: Off the Radar :::: Where Are They Now? It's been about one year since I first mentioned the name Not Wave sounds of Free Blood. (Check it) and in the last 12 months, the band comprised of John Pugh (former !!! 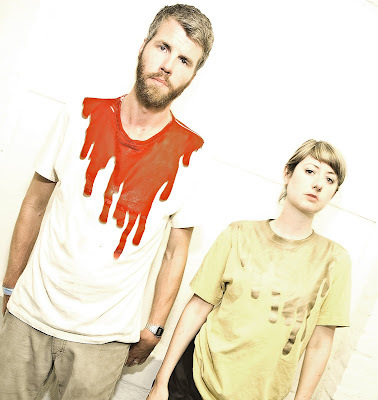 drummer and vocalist) and Madeline Davy (Octopi NYC) has steadily gained momentum and built a catalog of songs that they are finally releasing as a singles collection this week. Considering their first two songs took a couple of years to finish, I would say the release of The Singles on November 11th is quite of feat (that's today by the way). After listening to this band quite a bit, I realized why I liked !!! so much and I am wondering now that John Pugh is gone, will I like them again? In a recent Q/A with New York Magazine, the duo discussed what they went through to record the tracks. The band began with a old beat up drum machine Pugh had that he compares to "having a really drunk drummer who's trying to play beats." They even had another machine die out on them a day before a show, so Pugh had to run out and buy one and recreate all the songs. Understandably, all of these drum machines mishaps have left a bitter taste in their mouth, so they basically plan to make an electronic dance album with no electronic instruments. (I really hope they don't let go of the drum machine just yet). Most of these have been available on one of limited vinyl pressings but there are a few new remixes that really standout for me (British disco legend Greg Wilson smooths out Grumpy so much it is practically a different song). I think Grumpy is the duo's best effort yet. It takes all of the separate ideas from earlier singles to create a sweaty dance floor mess. I mean mess in a good way. The album should be out in your local online record shops on Rong/DFA momentarily. Here we have the album producers, The Brothers who also produced !!! 's Myth Takes taking a crack at their own work and take it waaaay deeper into the night. The part of the night people blackout during. Ugh, it's only Tuesday. Check out the duo performing Royal Family on Nigel Godrich's show "From the Basement". Here is a photo I took (with my iPhone, I apologize...) of Free Blood's performance in Miami at PopLife's 8 Year Anniversary earlier this summer. Hey if anybody is listening can I PLEASE get a bloody Free Blood shirt? Just tell me where to buy it! !